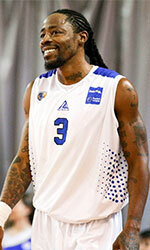 Al Khor (D1) landed 31-year old American forward Da'Quan Cook (205-100kg-87, college: St.Bonaventure). He started the season at Al Nahda in Saudi Arabian SBL league. Cook ended the last season at Tim Thomas in U.S. semi-pro league The Basketball Tournament. But the most of that year he spent at Titanes Licey (LNB) in league where in two games he averaged 9.0ppg, 4.5rpg and 3.0apg. Cook's college team won Atlantic 10 Tournament in 2012. He is a very experienced player. And here thanks to pro basketball Cook experienced life in eight different countries playing on five different continents. He is familiar with European, Asian, Latin American, African and of course North American leagues. Cook has played previously professionally in Bulgaria (Yambol), Canada (The Storm and River Lions), Colombia (Cafeteros), France (Hyeres-Toulon), Kazakhstan (Barsy Atyrau), Morocco (FAR Rabat), United Kingdom and NBA G League (Maine Red Claws).